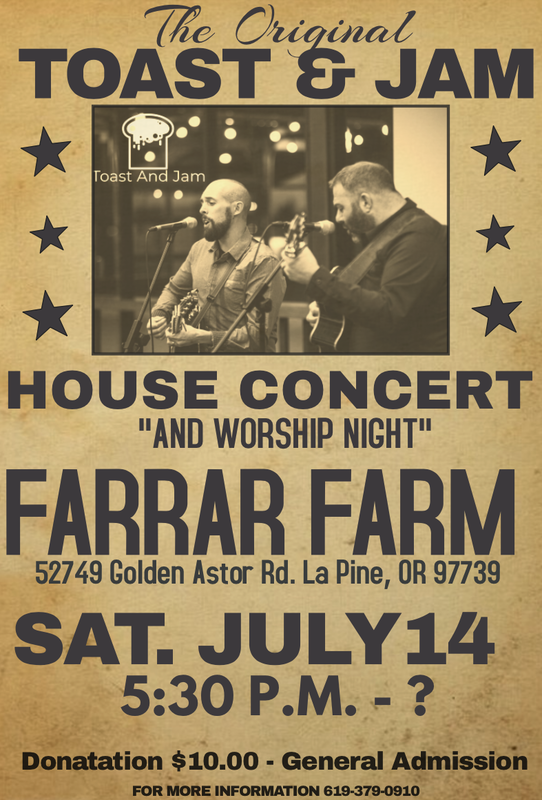 Bring your whole family to enjoy the music of Toast and Jam, an acoustic folk rock band from Bend. Suggested donation of $10/family - 100% of proceeds go directly to the Band! They will play a variety of music including worship songs. Toast and Jam is a “rootsy” duo featuring Ben Delery and Jeff Miller on acoustic guitars with dynamic vocal harmonies. You may also catch them playing piano, harmonica, ukulele, djembe, or banjo! Feel free to invite friends, RSVP here or to Stacy at 619-379-0910. BRING Lawn chairs/blanket, an appetizer/food, and a beverage to share.